May 21, 2010 - The forward-deployed amphibious transport dock ship USS Denver (LPD 9) was selected for the second consecutive year for the annual Chief of Naval Operations Ship-Helicopter Safety Award in May, honoring the ship with the most outstanding aviation safety record for 2009. Throughout the year, Denver conducted 3,544 mishap free flight hours, 1,202 day landings, and 378 night landings. The ship also transferred 1,210 passengers and 344 tons of cargo, and responded on short notice to provide humanitarian assistance and disaster relief to Taiwan following Typhoon Morakot and to Indonesia following a series of devastating earthquakes. "I am extremely pleased and proud, but not at all surprised, to have Denver repeat as the best of our Navy's amphibious warships in ship-helo safety," said Rear Adm. Rich Landolt, commander, Amphibious Force 7th Fleet. The annual fleetwide award recognizes sustained superior flight operations at sea with a commitment to aviation safety on deck and in the air. "Communication is the key to flight deck safety," said Lt. Wesley Barnes, Denver's air officer. "Our flight deck personnel are trained not only to verify the indications of the deck status lights, but to also confirm their intentions with primary flight deck control via the radios before taking any action involving aircraft." Barnes said Denver demonstrated her enduring commitment to safety and excellence in air operations by winning this prestigious award for the second consecutive year. "The fact that we have received this award for two years straight is a testament to the continuous hard work and dedication demonstrated by all Denver flight deck personnel," he said. Denver, commanded by Capt. 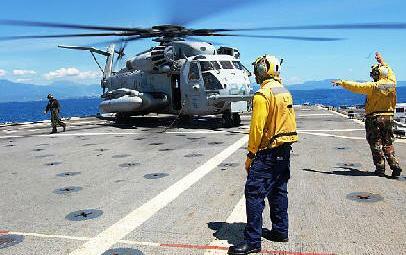 Gregory Fenton, is part of the Essex Amphibious Ready Group forward deployed to Sasebo, Japan.